The hottest table right now in Paris is not at some snooty Michelin 3-star restaurant. 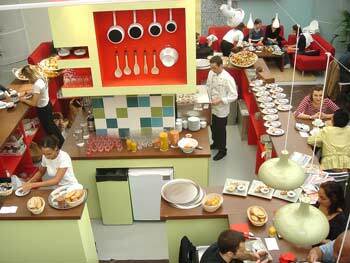 It’s La Table Nutella, a temporary café to celebrate the 40th anniversary of Nutella, the world best-selling spread. 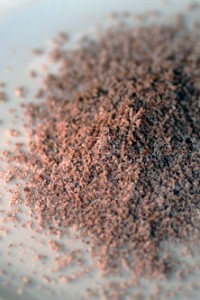 Nutella, a paste made of hazelnuts and chocolate (and, um, a few other things) was invented in the Piedmonte region of Italy, famous for it’s delicious hazelnuts. Each morning a line forms before 7 am, waiting (and hoping) for entrance. I kinda gave up, not really wanting to wake up that early and standing on the street. And I hate crowds of people grabbing food. Plus I had heard stories of a new French revolution brewing since there wasn’t nearly enough food to feed the hoards, and the staff was insanely stressed trying to control the crowd. It seems that the staff has figured out a solution to the problems plaguing the café by severly limited the amount of guests, which means the dreaded queue. Then like magic, I got an email from Louisa that she scored a VIP table and we could cut in front of the queue, something the French are so adept at they even have their own word for it: resquillage. Once seated, we ordered just about everything on the menu. All proceeds go to the group Rêves, so we didn’t feel guilty. This is a dessert created by pastry chef Philippe Conticini for the café, who has written a companion cookbook with stunning recipes using Nutella. 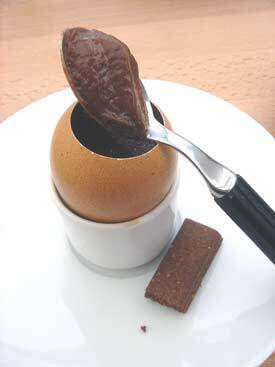 It’s an eggshell filled with a rich, creamy chocolate custard that tasted remarkably like great chocolate pudding sans the skin. The baton, or cookie, that came with it was crunchy and the perfect accompaniment..
We split a giant brownie, and when I say giant, that thing was huge… Très Américain! 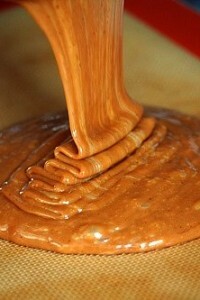 Layers of sticky, dense brownie batter baked with a ganache-like paste of Nutella and toasted hazelnuts. I loved it, but others felt it was too rich. So I ate theirs for them. The Apple-Nutella Crumble was an unfriendly Franco-American alliance on par with Bush and Chirac (Apple Crumble has replaced the ubiquitous Apple Tart in France as the dessert-of-the-moment)…although I don’t like apples and chocolate together, so I’m not the best judge. I did enjoy the fromage blanc with a dollop of Nutella but we all flipped for the little croissants which when split open, oozed out a serious amount of gooey Nutella inside. 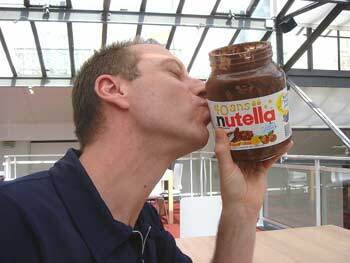 Seems I’m not the only one in love with Nutella. Can we please have a blogger exchange program and you send us one of yours and then a Bay Area blogger can go over your way? I guess we already did that with Pim…but these Paris blogger get togethers are getting more and more maddening on this end! 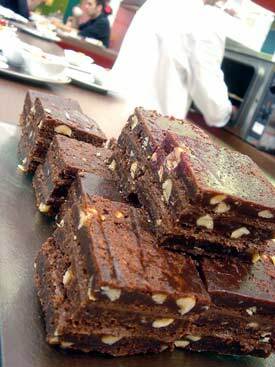 Where is the Nutella Brownie recipe? 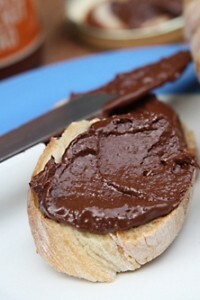 According to Louisa at Movable-Feast.com, the Nutella book by Philippe Contincini will be out here in France. See her site at: http://www.movable-feast.com/2005/05/la_table_nutell.html. Maybe the recipe is in there. I didn’t pick up a copy (although I should…) Perhaps you can order the book through Amazon.fr, or check a good cookbook seller in the US like Kitchen Arts and Letters in NYC or Cooks Library in LA.